Disney Dream Discounts: Cruises from $684 with a Best Price Guarantee. Aft on Deck 12, Disney Dream's Palo restaurant is one of two specialty restaurant only for adults. There are specialty pizzas prepared in Palo's on stage kitchen (pictured right). Starters include grilled eggplant, smoked trout, Caprese Salads, Shrimp Salads, Minestrone Soup, and grilled potrobello mushrooms with polenta. Stuffed Chicken Breast, Rack of Lamb, Raviollini with Shrimp sauce, Sauteed Fresh Fish, Tortelloni, and Orecchiette, are among main course entrees. Delicious desserts in Palo onboard Disney Dream complete an excellent meal in this upscale Northern Italian restaurant. The menu features an excellent selection of wines served by the glass or bottle, as well as bellinis and lemoncello martinis. 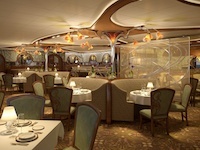 The charge to dine at Palo onboard the Disney Dream is $20 per diner. Palo also offers brunch on select cruises at a cost of $20 per person. Remy restaurant onboard Disney Dream is an elegant, adults only dining establishment featuring French cuisine in Art Nouveau splendor. Located on Deck 12, this new restaurant for Disney Cruise Line made its debut on Disney Dream and is an upscale dining experience for guests age 18 and older. With a $75 charge per diner for Disney Dream's Remy Restaurant, the cuisine and the experience is exceptional. The restaurant's namesake is Remy, the gourmet chef from the Disney-Pixar movie Ratatouille. And, yes, while what is Disney's most elegant restaurant afloat is named after a rodent; the cuisine, like the movie, is excellent. Dinner at Disney Dream's Remy restaurant consists of 8-9 small courses and a top-notch wine list. If you are traveling with a group, you may want to inquire about regarding the private Wine Room, or, even ask about the Chef's Private Table which is in a special room and the head chef will lead you through the meal. There is a dress code in Remy that requires gentlemen to wear jackets and ladies to wear either cocktail dresses or appropriate evening dress. Send us your review of the Disney Dream's Palo Restaurant or Remy Restaurant! We need your thoughts on what you liked about the restaurant, and, what you think could be improved. Use the form at the bottom of this page to let us know your impressions. We do suggest you make your reservations as soon as possible, preferably when booking your cruise. As soon as you make final payment, you can make reservations online for Palo and Remy. Palo and Remy are only for adults. Guests younger than 18 are not permitted in either restaurant. The per person charge for Palo is currently 20USD. The charge for Remy is 75USD. The cost of the brunch, when offered, at Palo is $20. How much should I tip at Palo and Remy on Disney Dream? First, bear in mind that all alcoholic beverages that you pay for will have a gratuity added. The cover charge does include gratuity, however, you may wish to consider giving an extra gratuity to the waiter or waitress who has served you. An appropriate amount is to estimate the value of the meal you ordered if you ordered it on land and tip 15-20% based on that cost. If you feel that the value of the meal was $50 were you to order it in a land-based restaurant, you should tip $7.50-$10. It is certainly your discretion not to tip, but, the waiters serving you are some of the best on the ship and should be rewarded if they provided you with an exceptional dining experience. Specialty drinks, wines, and beer are at current menu prices. Formal attire is recommended - gentlemen to wear jackets and ladies to wear either cocktail dresses or appropriate evening dress. THE MOST IMPORTANT TIP FOR PALO AND REMY!!! If you are on a cruise that is longer than 4 nights in length, book Palo or Remy on nights 5, 6 or 7. You will not know until you get onboard the ship your dining night in the Animator's Palate restaurant -- one of the dining highlights of the cruise where the ambience changes from black and white to color as your dinner progresses. However, the changing ambiance only happens during the first time you dine in the Animator's Palate. If you dine in the restaurant a 2nd time during your (typically 7-night) cruise, it is just a normal restaurant and does not feature the change from black and white to color. If you are on a cruise that is shorter than 5 nights, there is a good chance that you may miss Animator's Palate if you make your reservations before your cruise. We will e-mail when there is a change in price on this Disney Dream cruise. You can unsubscribe at any time. Disney Dream cruises from $684The latest deals and best discounts on all sailings. Take The TourThe Disney Dream Tour saves you time and money. Photos & VideosExclusive video tours and photo galleries of the Disney Dream. Best Cabins AdvisorExperts help you discover the best (and not so good) cabins on Disney Dream. Cabin Category GuideDisney Dream cabin category differences explained in plain english.